You see it coming from a distance, a swarm that grows larger the closer it gets. You can see the tiny winged beasts approaching like a black cloud, forcing you indoors to take shelter from the coming storm. Though you may have seen this happen each year in Boston, you might not understand what you’re looking at. Is this an alien termite invasion or a terrible ant colony gone mad? Termite or Ant: Can You Tell the Difference? It doesn’t take a seasoned termite exterminator to see the difference between termites and carpenter ants. At a distance, they look almost identical to each other. However, on closer inspection, you can make out the details that separate these two species. Once you’ve correctly identified the swarm, you’ll have a better idea whether you need ant or termite control in Boston, Massachusetts. Does the pest have a slender or broad waist? You can spot the difference between termites and carpenter ants right away by looking at the area between the thorax and the abdomen. Carpenter ants have slender waists and bulbous abdomens. Termites have broad waists with almost no separation at all, giving them a wider-looking body compared to carpenter ants. Are the antennae straight or bent? Check out the antennae when identifying termites and carpenter ants. A carpenter ant has two antennae that bend in an almost 90-degree angle. A termite’s antennae curve slightly and extend straight out from its head. What do the wings look like? Termites and carpenter ants have four wings; however, the termites’ wings are longer than their bodies and equal in size and shape. Carpenter ants have short hind wings and long fore wings. Whereas termites eat wood, carpenter ants burrow and build nests in wood. Worker ants have a reddish, darker appearance compared to the transparent or cream-colored termite workers. 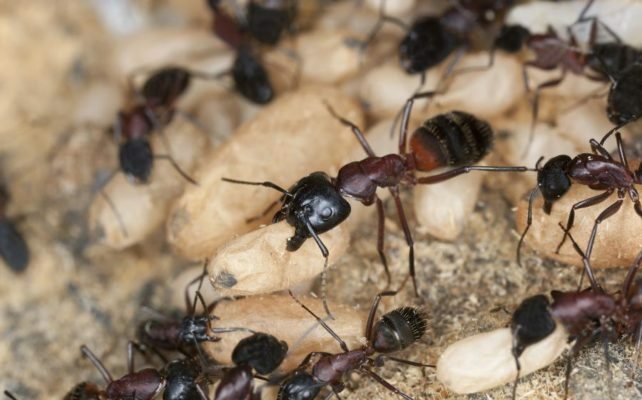 Carpenter ants leave behind sawdust as they burrow in ceilings, decks and indoor cracks. Termites cause wooden timbers to weaken, crack and crumble over time. Don’t let the swarm scare you away this spring. Contact Modern Pest Services for information about how a termite exterminator can eliminate infestations and protect your home and property. With professional termite control, you can avoid future repair costs and say goodbye to invasive termite swarms for good.